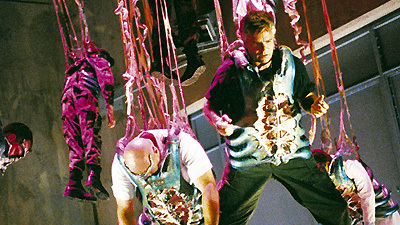 During a routine medical exam, SG-1 is sedated and left unconscious. Teal'c awakens to find that the base has been taken over by aliens capable of taking the form of SGC personnel. No one on base can be trusted. Carter escapes to report the foothold situation to Colonel Maybourne, but alien doubles of O'Neill and Daniel catch up with her. Their identity is revealed when Carter discovers the device that enables their physical transformation, and uses its technology against them. Returning to the SGC, she joins the real O'Neill and Major Davis to expose and defeat the retreating aliens. SG-1 returned from a planet with a temple that might have been Kheb, but there was no sign of the Harsesis. The aliens were preparing for an invasion of Earth as a viable new homeworld. They hid their activities by closing off Level 23 because of a supposed tetrachloroethylene rupture, a gas which causes hallucinations and paranoid delusions. The alien procedure uses an electronic device to duplicate the image, and another to access the mind and thoughts, of the human counterpart kept alive in suspended animation. A sustained specific tone will disrupt the devices. The humans wake up if the alien dies, or is disconnected from the device, or goes through the gate. The escaped aliens may retain the knowledge of their human counterparts. Those left behind were linked to their leader, and were killed when he self destructed. The procedure failed to work on Teal'c and Carter because their body chemistry had been altered by the presence of the Goa'uld symbiote. The foothold situation began when SG-6 returned from P3X-118 as alien duplicates, and began replacing members of the SGC and Major Davis from the Pentagon with alien counterparts. P3X-118 has now been locked out of the dialing program, all access codes have been changed, and returning teams in the future will be scanned by a high frequency blast. Carter met Maybourne at The Old Bailiff Café outside NID Headquarters in Washington, DC.